Nancy Bullard, wife of Morgan Coley. She is a direct ancestor to many members of the Abernathy, Howell, Knight and Young families who are also buried here. 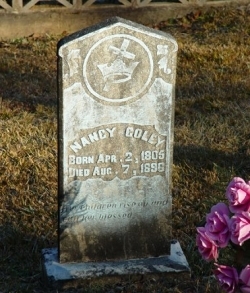 Of Mrs. Nancy Coley, who was born April the 2nd, 1804 and died August the 7th, 1896. At the time of her death, she was ninety-two years, four months, and five days old. She was married to Morgan Coley, October 1821. She was born in Abbeville District, South Carolina, and moved with her parents to then Cass County. She professed faith in Christ at the age of 16 and united with the Baptist church and lived a faithful member till God took her to himself. She only lacked a few days living in the service of the Master 76 years. She never had but one church letter that was to constitute the church that she died in. It is a struggle to feel I have no mother, but I feel I still have mother’s Savior and that I can go by God’s grace to Mother’s heaven. So we can cheerfully leave our dear mother in the hands of a merciful God, and bye and bye with Father and Mother and six children meet on the sunny banks of sweet deliverance. I, here over the graves of Father and Mother, two sisters and one only brother, make an assignation with their sainted spirits that by God’s help, we will meet them where sickness, sorrow nor death can ever come and the gravedigger’s spade will never cleave the side of the everlasting hills. But we are all hastening on to the grave and to our final doom. I owe to my dear mother, under God, all I am or ever hope to be, for her precious life and Christian advice were ever before me. While a poor Confederate soldier, her prayers were a shield to me, and when tempted to do wrong, her life of Christ-likeness seemed to barricade the way of temptation and ward off the blow, and that gentle hand in sickness seemed to soothe my aching head. But we are so glad that she was spared so long and would have rejoiced to have kept her, though our loss is her gain, and we know that her body will suffer no more. And while our eyes are dimmed by the tears of bereavement, we pass on expecting after a while soon to greet her over yonder, and we look for her to meet us just on the other shore. Oh, how we did love her and how we hate to say our mother is gone, not dead but sleepeth, and she being dead yet speaketh. Farewell, dearest mother, farewell. We are coming. This loving obituary was written by her son Jesse M. Coley.